The AOC 1000DPI Optical Keypad and Mini USB Mouse combines the functionality of a mouse and a keypad into one kickass device! It is perfect for the laptop user that wants the convenience of a standard mouse and the functionality of a full sized keyboard keypad. 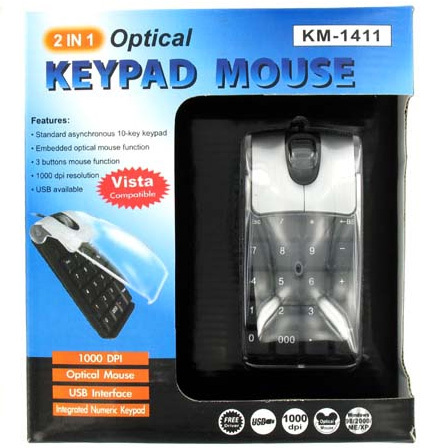 The Mouse/Keypad features a transparent cover to prevent the accidental depressing of keypad buttons, while also providing a cool design effect. GUI navigation is silky smooth with a 1000DPI resolution optical sensor and a 2 button +1 scroll wheel/button mouse clickers.